Humidification - Unified Mechanical - UNIFIED MECHANICAL INC. The electrode steam system produces pure uncontaminated steam with variable output through electronic power control of the electrodes. 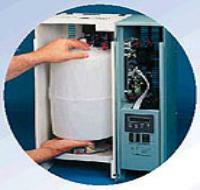 Water borne minerals remain in the cylinder and are periodically flushed out through the automatic cylinder drain. On NHMC and NHP models the drain automatically empties the steam cylinder if it is not operated for three days. Solid mineral scale sinks to the bottom of the cylinder which, when filled with residue, is easily removed and replaced. Adding the right amount moisture to your home is essential to create a healthier and more comfortable environment. Ask us about quality humidification solutions today!